“My entire experience with Dr. Kazemi’s office and staff was nothing short of superb. I came for a wisdom tooth extraction, having done 2 nearly 20 years ago as a teen. Dr. Kazemi’s staff was very friendly and helpful in working with me to schedule the appointment and get the necessary x-rays from my dentist. The day of surgery I was quite nervous and the doctor and his staff put me completely at ease. Each professional has an excellent bedside manner and really takes the time to ensure that patients are comfortable during every step of the process. Dr. Kazemi called the evening of surgery to ensure I didn’t have any further questions or issues. the follow up emails and video for post-op instructions were very useful and thorough. My follow up appointment a week later was also efficient and smooth. “I was always met with friendliness and a willingness to make me comfortable. Waiting time was minimal. Rachel (at the front desk) was extraordinarily helpful and went the extra mile for me…very much appreciated. She was extremely competent and always very friendly on the phone. questions at anytime. His access was extraordinary. 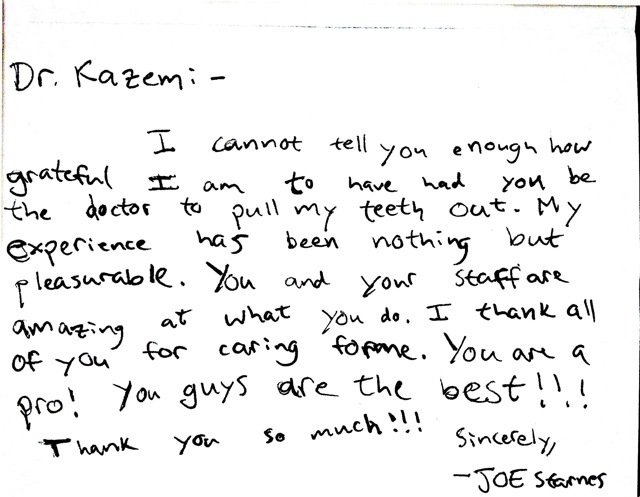 “I am so grateful our orthodontist recommended Dr. Kazemi ! Our 12 year old is very nervous about anything medical so of course I was worried about how she would be with having 5 teeth pulled. It was nerve wracking for no reason. First Dr. Kazemi & his staff are excellent at going through the procedure & after care for oral surgery. They are very thorough and professional concerning everything from pre-op to the procedure to after care & even payment. “Dr Kazemi, I thank you for your gentle procedure and for providing me with an emergency appointment. Your attention to my surgery today surpassed my expectation (based on my past dental experiences) by 150%. Additionally, from my first phone contact with Katalina, to Rachel to Maria and the X-ray tech were so assuring and I felt very comforterable! Tres positive. Many thanks! A few weeks ago, I sat in a dentist’s chair, sobbing in pain, asking to have a tooth extracted. Because there was nothing visible on x-ray, the dentist chuckled at me and sent me on my way. The next day, I was in so much pain, I hyperventilated until I fainted. I went to see a different dentist who treated me with dignity, but wasn’t willing to extract the tooth. Today I went to see Dr. Kazemi, with very little hope that my weeks of excruciating pain would be relieved. An hour later, I was on my way home, pain-free, with one less chomper. The staff members were friendly, efficient, and informative, and the environment was very clean but warm with gentle music in the background. Most importantly to me, Dr. Kazemi was empathetic, and used my subjective measure of pain as the deciding factor for treatment. I am so grateful to the whole team for releasing me from my prison of pain. I just ate a bowl of piping hot soup with a glass of ice cold water, and was so happy, I almost cried. Dr. Kazemi and team, you are amazing. Thank you! Robert In His Own Words from H. Ryan Kazemi, DMD on Vimeo. “Dr. Kazemi and the rest of his staff are amazing! The office is nice and modern as well. I went in to get all 4 of my wisdom teeth extracted. I had NO SWELLING, NO BRUISING, and minimal bleeding – I never took any of the pain medication either. I was back at work the next day feeling great and all my co-workers were shocked! “Dr. Kazemi and his staff were incredibly accommodating in scheduling an appointment and having what I needed done. The whole experience was surprisingly fast and simple. “Dr. Kazemi is fantastic. Our daughter had all four wisdom teeth extracted. There was never any bruising, minimal swelling and very manageable discomfort following the procedure. Dr. Kazemi even checked on her personally the evening of surgery. We also received emails the week after surgery with helpful reminders. “I feel a real obligation to write this recommendation online because it was through review of the online recommendations that my wife and I decided to choose Dr. Ryan Kazemi for my oral surgery. It had been determined that I needed an extraction of tooth with a complex root canal failure with a resultant abscess. This oral surgery practice is a model for medical practices of all specialties. The staff are professional, courteous, knowledgeable, kind and timely. They fill out the insurance forms and the prescriptions are given when you leave, along with gauze in a little kit with all the instructions and referrals if needed – no detail is overlooked! Dr. Ryan Kazemi is a surgeon whose expertise and experience is immediately obvious from his manner which is calm, confident, extremely thorough and reassuring. The nature of the problem, its cause and the treatment choices available were explained in detail. Each step of the procedure itself was made clear. The surgical procedure was extremely efficient, comfortable and absolutely painless. The above description merits the highest aspect of a 5*rating that could be given. However, I was even more impressed with the extraordinary nature of the post-procedure care. As a specialist in rehabilitation medicine who has been directly involved in the care of large numbers of postoperative patients over many years, I have never encountered a surgical postoperative follow-up of this kind. It can only be described as exemplary. Careful review of my condition after the procedure. Clear verbal and written instructions before leaving. A postoperative early evening call from the surgeon. Multiple and timely reminders from the staff about my postoperative care. All dental care and medical care should be provided in this way. This is a highly computerized office where the computers assist, rather than control the care. The result is that this practice seems to really be about people being cared for by people. From my experience, Dr. Ryan Kazemi cares for his patients in the best way imaginable. “I had orthodontic treatment 25 years ago, and my orthodontist decided I only needed to extract my lower wisdom teeth. So I was stuck with my two upper molars for many years instead of having all of my wisdom teeth removed at the same time. “For the wisdom teeth consult: I walked in feeling nervous and resigned. I left feeling at ease with the procedure and made confident by the non-pushy, friendly and extreamly organized staff. There was perfect efficiency, yet I never felt rushed. I really felt like every single person I encountered was great at their job. The next visit, the surgery was over before I even knew it. Post-surgery I really, really appreciated Dr.Kazemi’s instant responsivenss to post-op questions via phone. It allowed me to self-care with confidence. The follow-up auto-emails are also a nice touch. “From the moment I decided to work with Dr. Kazemi it was a wonderful experience. I am the third person in my family to have Dr. Kazemi remove our wisdom teeth- and I would not have gone with anyone else. Deciding to pay out of pocket was not an easy choice, however when it comes to medical procedures I only want the best- Dr. Kazemi and his staff truly treat you like a patient should be treated, with respect, kindness and they exceed all expectations. From the initial phone calls and emails and the consultation appointment, to the day of the surgery- everything went great. I had four very impacted wisdom teeth that took a lot longer to recover. Whenever I called with any questions or concerns Dr. Kazemi himself would make sure he would speak to me about my concerns. “Nice office and friendly staff to put you at ease. 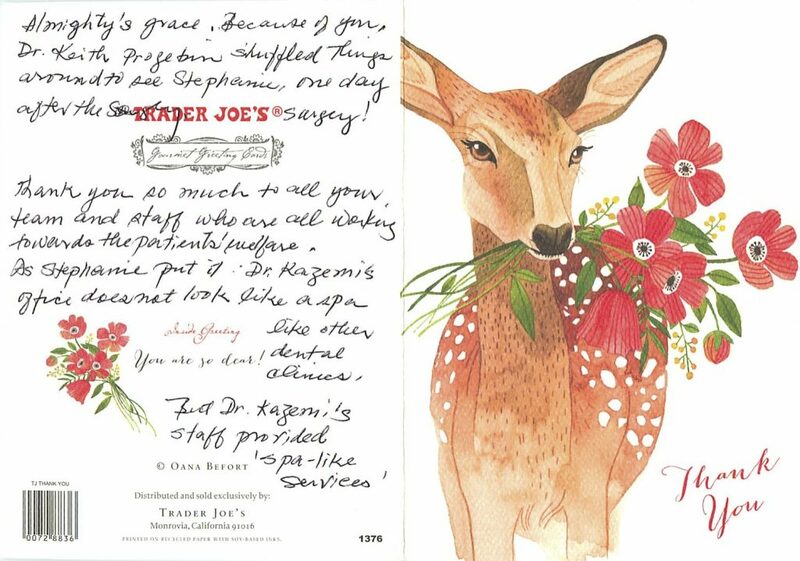 The personal e-mails from Dr. Kazemi are a nice touch–you can actually e-mail him after surgery and he responds. For me I received two complimentary followup appointments which was nice. “Dr. Kazemi and his staff were just phenomenal. After searching months for an oral surgeon and having no luck, I am so grateful to finally have found such a kind, well-experienced, and professional doctor. Dr. Kazemi and his staff were very informative and caring. Based on what seemed to be horror stories about oral surgery, I became hesitant and leery about even having a wisdom teeth extraction procedure done at all. But because I needed to for future orthodontic treatment, it was time to stop the procrastination and only pray that I find someone quite the opposite of all the negativity I’ve been hearing about teeth extractions. I thank God for leading me to Dr. Kazemi, because my whole experience was absolutely great. Far exceeded my expectations! I highly recommend anyone to visit Dr. Kazemi. Thanks again for everything, Dr. Kazemi and Staff! “My son’s wisdom teeth started to hurt on Sunday night. I was apprehensive because he is traveling abroad for Spring break. The appointment was quickly scheduled for Tuesday morning; he had the surgery and the consultation on the same day. The procedure was done under IV sedation which I believe it was the best choice, considering that my son woke up comfortably and surprised the procedure was already done! Dr. Kazemi and his team are outstanding, they take care of every detail from the moment you call their office, you know you are in good hands. Furthermore, we received a follow-up phone call from Dr. Kazemi on the same day, which I thought was very thoughtful. The follow-up emails with convenient videos that walk the patient through as they advance in their recovery are extremely helpful. ” Dr. Kazemi was recommended by my long term restorative dentist. The initial decision to go forward with an implant was based on the irrefutable logic of restoring the lost tooth site rather than potentially putting the viability of the two adjacent teeth in play with a permanent bridge. 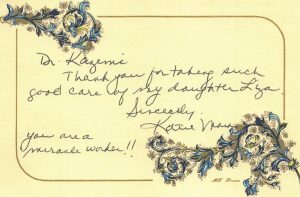 Dr. Kazemi is personable and authentic, quietly decisive. His office staff and assistants are terrific. He is well trained and experienced. Compared to my hurriedly researched resources (all out of date), his numbers are excellent. He gives you a choice of anesthetics. You are prepared pre op and most importantly, he and his staff support you post op with helpful and encouraging emails and videos during the period of maturation of the implant site. This in conjunction with follow up visits lets you feel his good judgement is carefully applied until he sets you loose to have the crown restoration completed. And finally, there is a very instructive video by his hygienist on optimal oral hygiene of the implant site. Thoughtful and attentive care from beginning to end. I am very happy with the outcome and the work comes with a lifetime guarantee. I hope I don’t have to go back in the future, but if I do, I will be confident in and thankful for his good work. “I had a great experience. Everything was explained to me clearly and the process went smoothly. My only concern was the bleeding, which lasted 12+ hours the day of surgery but I was assured by Dr. Kazemi that this was normal. There was very little swelling even though my teeth were impacted, which I think is indicative of Dr. Kazemi’s skills as a surgeon. The pain was very manageable and I was fine just taking Advil. I’m hoping the insurance process will go smoothly. “Dr. Kazemi is an outstanding oral surgeon with a rare combination of skills–he is extremely smart and skilled, but also kind, patient and compassionate–he really gets how frightening oral surgery can be for some people. His office is run in a super efficient manner, with a team that is highly responsive and competent and simply a pleasure to work with. He makes oral surgery seem easy and I have already recommended him to many friends and family. My 3 surgeries with Dr. Kazemi all had excellent outcomes with no complications or significant pain. For each, he and his team provided clear information about what was involved in the surgery, how much it would cost, and pre and post operative support, including excellent instructions about home care, and assistance with my insurance. 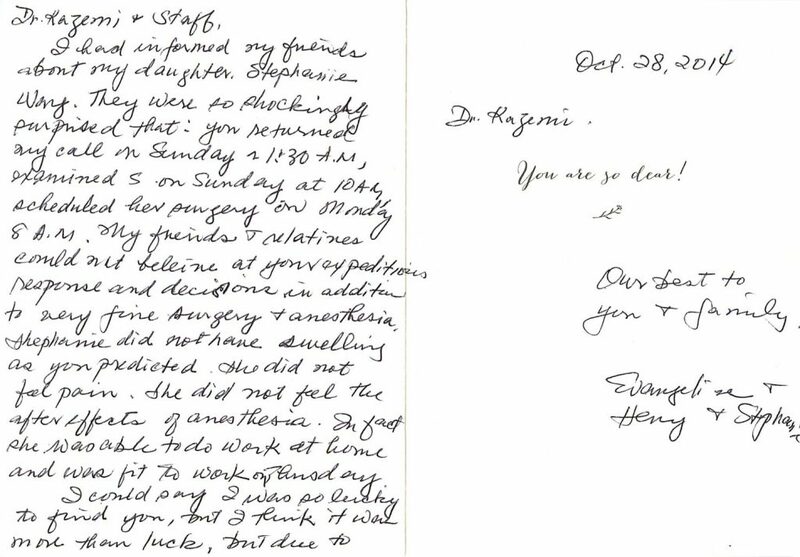 I especially appreciated knowing that in the event I had complications or even questions, Dr. Kazemi was only a phone call away–even over a holiday weekend. “I have had two implants in one year and every treatment has been perfect and extremely satisfactory! “I went to Dr. Kazemi with a very particular and challenging condition. On the first courtesy consultation appointment I observed that Dr. Kazemi possesses a high level of experience, professionalism, and knowledge. He listened to me attentively as I explained my case and how it developed throughout the years. After taking a Panoramic X-ray and studying it, he very quickly came up with a treatment plan and a financial estimate with which I totally agreed. For the first scheduled surgery I was eager to get started; relaxed, and confident. I felt the same for the rest of the procedures. My initial feelings were confirmed and Dr. Kazemi proved his expertise along with his great human qualities of honesty, patience, and understanding. Dr. Kazemi personally follows up with phone calls after the procedures and returns calls promptly. Dr. Kazemi’s office staff is outstanding. They provide an excellent costumer service, always polite and caring. Since I called the first time to get information about scheduling an appointment, Ryan has been an extraordinary liaison, courteous, polite, and attentive to extra details. Lisa is an amazing surgical coordinator. She knows what is going on and she advises wisely, always with a positive attitude. It was never a problem scheduling, rescheduling, and rescheduling again. I appreciate that Shainna sent e-mails reminding me of what stage of the procedure we were at, as well as what I should expect and do. Of course, medical assistants Ludy and Adriana are very gentle, caring and friendly. “My experience was wonderful, to say the least. While getting your Wisdom Teeth out is not the most enjoyable experience, Dr. Kazemi and his staff made the only terrible part the actual healing process one must go through on their own. From the beginning, the staff is courteous, respectful, engaging, and professional. I’m not from around here and found the option to submit your insurance through their online page extremely helpful in finding an oral surgeon. Within a day I received a phone call from the staff discussing how my insurance would work in terms of the services they offered, which immediately allowed me huge relief. After that, I was able to set up an appointment within a week. Their office is small, but I think that allows them the capacity to really pay attention to their patients. It is extremely high tech, and I felt comfortable with all the equipment and the staff using it. Because you can do everything to prepare for your visit online, I waited little more than five minutes. At which point they promptly took me back and x-rayed my mouth. The staff was engaging and fun the entire time. I had a chance to actually look at my teeth and see every single detail laid out in front of me. Doctor Kazemi came in about another five minutes later, and asked me the usual questions about what was bothering me with my teeth. He was extremely helpful and explained in detail why my teeth should come out and, in laymen’s terms, his procedure. I was able to get an appointment for extraction the following day. The staff spent the next 20 minutes or so going over exactly how the extraction procedure would go the following day and what I needed to do to prepare and what I should do to heal. As well, their front desk staff goes over all payment and terms with you in very specific words. They are truly helpful in explaining anything from ways your insurance would cover something to how you may react to the anesthesia. My procedure went off without a hitch. I waited barely two minutes, and was in and out of the office in about an hour and fifteen minutes total. Even though the previous day they had gone over home care thoroughly–and provided a take home packet–they still went over it again for me, and especially for my friend (I was still a little loopy). They followed up with another home care email, and even Doctor Kazemi called later the night of the procedure to check up on me. To Summarize: The staff and Doctor Kezemi are fantastic. They are not only trustworthy at their jobs and provide a great service, but their customer service is fantastic. It is not a gimicky way, where you feel like they are just being nice to get great reviews. They genuinely care about their patients, and their health and well-being. I highly recommend this extremely professional staff. And the fact that they were so willing to take time out to explain just about every detail, right down to the billing of teeth, and the way insurance works, is perfect for people less medical administratively inclined. “I was seriously injured in an auto accident in-the-line-of-duty as a police officer. My mouth & teeth sustained terrible trauma and subsequent medical treatment & medicines destroyed my teeth. “My five children, husband and I have had fantastic dental care by Dr. Hamid Kazemi. His staff and assistants are helpful and incredible professionals. “I am 19 years old and I like to think of myself as brave…but not when it comes to the dentist. I work at Orchin Orthodontics up the street from Dr. Kazemi and we work closely with his practice so my doctors referred me to him for my wisdom teeth extraction. Lets just say I was a mess. I came in SOBBING and the moment I sat down, Dr. Kazemi made me feel safe and at ease. He is loving, and caring, and patient. As for the procedure, I had all four wisdom teeth extracted and I opted for IV sedation, which let me tell you, was the right choice. I came into the office on the day of the surgery and was a complete sobbing mess. I sat down in the chair and immediately they put a warm scented neck rest around me, along with a heavy warm blanket. I was especially scared for the needle, so Dr. Kazemi promised me I wouldn’t see it, which I never did. They gave me laughing gas that made me extra relaxed and the nurse held my hand as Dr. Kazemi started the IV- practically painless. Next thing I knew I was awake and lying down on a comfy bed in a recovery room with my boyfriend by my side. They give you all your pain meds and antibiotics at the end of surgery too, so you don’t have to go to the pharmacy which was great. It took me about 5 days to really feel back to normal but the overall experience was top notch and now I feel silly for being so scared! The entire visit probably lasted an hour, the surgery only being about 25 minutes. I would recommend Dr. Kazemi to ANYONE and EVERYONE. My experience was better than I could’ve ever imagined, and his staff were FABULOUS. SO responsive, kind, caring, and wonderful at their jobs. “Dr. Kazemi and all the staff were very kind & professional. “One day, after eating some Tostitos, I began to have severe isolated mouth pain. After looking up the symptoms online, I thought I might have to get my tooth pulled, so I scheduled an appointment with my dentist. My dentist spoke with me and referred me to Dr. Kazemi. I called their office and spoke to Emily, who was very friendly helpful, and explained my situation. This being on an early Friday afternoon, I was surprised that I didn’t have to plead/beg to get squeezed in. Luckily their office is a few blocks away from the Bethesda metro stop, making it convenient and really easy to find. When I arrived, I filled out the standard forms and didn’t have to wait long at all to see Dr. Kazemi. After thanking him for fitting me in, we talked for a bit and he seemed pretty cool. After my x-rays were taken, he concurred with the tooth extraction. The removal was quick and painless, I chose the option of Nitrous (laughing gas) on top of the local anesthesia, as I was a bit curious…When the extraction was done they gave me some time to recover and regain my bearings from its effects rather than having me pay and leave immediately, which I was thankful for as I was a little “out of it”. Before leaving I was given a bag full of provisions like: pain meds, a re-usable cooling/heating pack, reading material to care for the extracted area, a CD of soothing-Zen music, and a business card magnet. Before leaving, a follow-up appointment was scheduled to get the sutures taken out, and I was off home to recover. What surprised me however was later that day the doc called to follow up and to see if everything was ok, etc… To me these extra little steps really did go a long way in my impression of the facility, and their commitment to excellence.